Federal dam managers are raising the level of the Columbia River to free barge hauling 1 million gallons of gasoline that ran aground in the river this morning about an hour east of Portland. Coast Guard investigators and inspectors were on scene by about 8:30 this morning, roughly 5 hours after the tug and its four barges become stuck, said guard spokesman Lieutenant Junior Grade Ryan Harry. The tug and barges involved are operated by Tidewater Barge Lines, which has an office in Vancouver. "Right now there are no reports of any sort of pollution in the water," Harry said. Inspectors have not seen any sheen in the river, and took soundings of the cargo to determine that none of the gasoline has spilled, he said. By mid-day, three barges had been removed from the tug and only the fuel-carrying barge remained. That barge, the New Dawn, is double-hulled, which reduces the likelihood of a spill. The Coast Guard planned to inspect the space between the hulls to make sure the outer hull was not breached in the grounding, Harry said. "It's just a barge stuck in the mud," John Pigott, a Tidewater official on scene, told the Department of Environmental Quality, said department spokeswoman Marcia Danab. Meanwhile, the U.S. Army Corps of Engineers is manipulating the gates at Bonneville Dam to raise the level of the Columbia behind the dam by about a foot to see if that will float the barge free, said Matt Rabe, a spokesman for the Corps in Portland. The river level should be raised by this afternoon, but if the barge is firmly stuck, raising the river might not help, Rabe said. Tidewater transports grain, petroleum products, wood products and fertilizer the full commercially-navigable length of the Columbia and Snake river system. Last February, a Tidewater tug pushing two empty grain barges and a barge filled with 1.7 million gallons of diesel fuel ran into the upstream gate at the John Day dam's navigation lock on the Columbia River. No injuries or fuel leakage were reported during that event by the U.S. Army Corps of Engineers, which operates the dam. In this morning's incident, the tug, named The Chief, and four barges ran aground while heading up the Columbia River just west of the Hood River Bridge at about 3:30 a.m. Two of the barges appeared to be empty; the others were a fuel barge and an apparently loaded container barge. 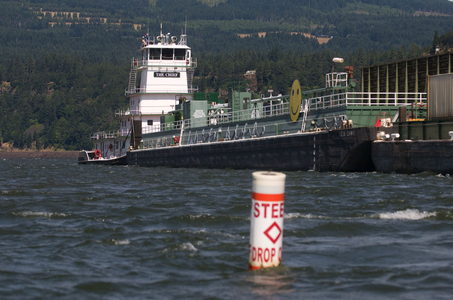 They are aground about 50-feet from where the sandy fan of the Hood River delta reaches into the wide Columbia River. And according to coordinates from the Coast Guard, the tug and barge are about 1,000 feet outside of the Columbia's navigation channel, which is marked by red and green buoys, said the Corps' Rabe. Coast Guard inspectors who were in the river in a small boat this morning reported that the buoys marking the channel were in their appropriate location. The loaded fuel barge appears to have ridden up on the stern of the container barge in front of it, but no obvious damage was visible from water level. Nearby, kiteboarders continued to play in the wind-whipped whitecaps on the river near the grounded barges. Two years ago a flood in the Hood River expanded the reach of the sandbar at that river's mouth into the Columbia by 26 acres, but it's not known if the larger sandbar is related to today's grounding. A Portland-based Coast Guard official said inspectors will try to determine what caused the vessels to run aground. "It could be a couple of days before we really know what happened there," Harry said.